This past year I was glad to serve on Superintendent of Public Instruction Tom Torlakson’s Environmental Literacy Task Force, and I was delighted the new California Blueprint for Environmental Literacy was released to the public on September 15, 2015 by Superintendent of Public Instruction Tom Torlakson. The plan presents a vision for how all 6 million students in California can become environmental stewards and help address the significant environmental challenges we face. California is our nation’s largest and most diverse state, with a legacy of pioneering work in the field of environmental education and green and sustainable schools. I am proud of the new Blueprint for Environmental Literacy, and I hope it informs not only our work in the state, but across the nation. In 2015 Inverness Associates completed an extensive effort to map the state of green schools nationally, and the results show ways in which private independent schools are playing leadership roles in the effort to create more environmentally sustainable schools. Over 25,000 school principals were surveyed, or approximately a fifth of the nation’s total, and the response rates from three parallel surveys allow for statistically meaningful generalizations about the strengths, weakness, challenges and opportunities our schools face. 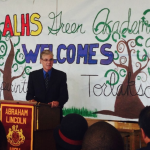 On Earth Day, April 22, Secretary of Education Arne Duncan announced this year’s recipients of the Green Ribbon Schools award from the U.S. Department of Education. Once again private independent schools from across the country were among those selected as exemplary green schools. Since the Green Schools National Network was launched in 2010, I have attended each of the five national conferences, and this year’s gathering in Virginia Beach, Virginia demonstrated that the national movement for healthy, environmentally sustainable schools is making significant progress. Led by executive director Jenny Seydel, the mission of the GSNN is to advance the national green and healthy schools movement by connecting like-minded and passionate education, non-profit, corporate and public sector individuals and organizations. The conference drew nearly 1000 participants from all over the US; the top states sending representatives included California, Colorado, Florida, Minnesota, Wisconsin, Virginia, and New York, and each has a well-developed green schools presence and exemplary green schools. The GSNN “Greenprint” defines five elements of a green schools: curriculum that advances environmental literacy and sustainability; stewardship and service learning; sustainable facilities design and management; health and well being; and strong partnerships and networks. 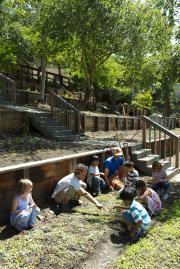 In January 2013, Inverness Associates conducted a comprehensive survey of environmental education and sustainability in the San Francisco Bay Area. 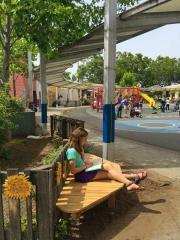 The survey was commissioned by the Environmental Education Collaborative (www.eecollaborative.org), a group of eight informal environmental organizations, including California Academy of Sciences, The Exploratorium, Golden Gate National Parks Conservancy, Lawrence Hall of Science, Monterey Bay Aquarium, NatureBridge, and Pie Ranch. The survey provides a detailed portrait of the successes and challenges experienced by private schools incorporating environmental education and sustainability practices. Anticipating the release of my second book, Greening America's Schools 2.0, in February at the National Association of Independent Schools Annual Conference in Philadelphia, I have begun a long-term research project to evaluate the state of environmental and sustainability education in Bay Area private schools. This study especially seeks to understand the connections between the formal, K-12 green schools efforts and the invaluable education that is offered by a network of informal environmental education institutions. It is my hope that the research will enable us to grow stronger connections between the two communities here in California, and in so doing suggest best practices for regional associations around the country. The report is due out in late spring. After speaking with a group of environmental educators in January at the Punahou School, I received an invitation to help plan an innovative exchange program that would weave together two central themes articulated by the National Association of Independent Schools: global and environmental sustainability. Namji Steinemann, Director of the AsiaPacificEd Program and Associate Director of the Education Program for the East-West Center in Honolulu, called to describe an opportunity to bring youth leaders from the Asia Pacific region to the United States for a three week program of cross-cultural, leadership, and environmental education. Long an advocate of global education, and more recently focused on environmental sustainability issues, I quickly said yes! The first exchange in a three-year program took place this fall and heralds an important opportunity to prepare young leaders for the coming global challenges their generation will face. My research on K-12 green schools has convinced me that we need to forge stronger ties with the university sustainability community. Here are two examples from the college and university world that illustrate the significant strides that are being taken. 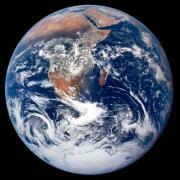 And it is for the world of higher education, after all, that we are preparing our students. Ever since Scott McKenzie’s iconic song in the summer of 1967 urged visitors going to San Francisco to “wear some flowers in your hair,” the city has been associated with a progressive tradition that recently has enabled it to move to the forefront of the environmental sustainability movement in education. Beginning in the 1980s, San Francisco adopted a series of ordinances to promote sustainability, from innovations like curbside recycling and bottle deposits to organic green waste diversion and a ban on plastic bags. The city has taken seriously its goal to eliminate waste. Shortly after the Kyoto Protocol, San Francisco declared its intention to reduce greenhouse gas emissions 20% below 1990 levels by 2020, and in 2004 the city announced its Climate Action Plan. In this culture of environmental innovation, the San Francisco Unified School District, which educates 55,000 students in 120 schools, has developed a model green school program, one distinguished by its comprehensive nature, level of support, and documented accomplishments.